"Wendy's book is an impressively thorough account of the marketing options open to Internet businesses today. I have it within reach of my desk and I intend to make good use of it." You've already got great content - now, monetize it! Dozens of top publishers, marketers, business owners, and entrepreneurs are already using Wendy Montes de Oca's SONAR Content Distribution ModelTM to earn amazing ROI from content they already have. You can, too-even if you've never done Internet marketing before! 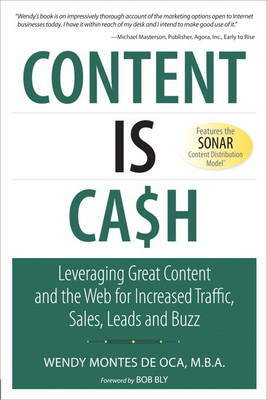 Content Is Cash shows you how to systematically integrate and synchronize today's best web marketing techniques to drive more traffic, buzz, leads, and sales for your business. It's not theory. It's a proven, cost-effective and real-world strategy allowing anyone with content to turn traffic into profits...and the results are quantifiable! Inside you'll find powerful, easy, and virtually no cost ways to maximize content syndication, online PR, social networking and bookmarking, article directories, and guerrilla marketing inforums and message boards...to achieve breakthrough results on even the smallest budget!